Small businesses hit hard by rent increases, changes in co-op rules. This piece was published Jan. 29 in Our Town. Fred Kooby signed a lease for his stationery store on the Upper East Side the day John F. Kennedy was assassinated in 1963. Since then, he’s operated Blacker and Kooby at the same location on Madison Avenue and 88th Street with a handful of long-time employees, some of whom have been with him for decades. But come Jan. 31, the Carnegie Hill mainstay will be closing its doors and relocating north to Lexington Avenue, with paired-down offerings that will only include the printing department. In one sense, the closing of a long-time neighborhood retailer has become the new normal in Manhattan, as rising rents make it ever-tougher for mom and pop stores to keep the doors open. But those pressures are now being exacerbated by a change in federal tax rules affecting retailers who rent space from co-op buildings. Prior to 2007, the “80-20 rule” required that these buildings receive 80 percent of their overall revenue from shareholders who owned apartments. 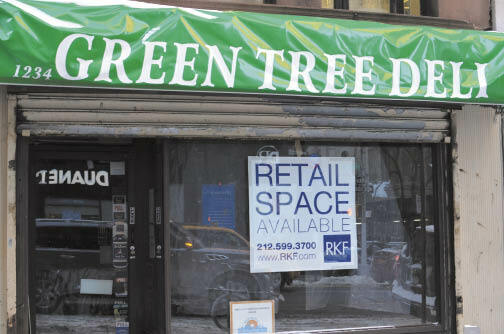 Neighborhood favorite Green Tree Deli in Carnegie Hill is now closed. But in 2007, that regulation loosened, enabling buildings to generate more money from leasing out retail space. Now, as five-year leases have started to expire, co-op buildings are cashing in on the ability to dramatically increase their business tenants’ rents. Blacker and Kooby is one of five businesses along a four-block stretch of Madison Avenue that have closed or moved recently, along with the restaurant Jackson Hole, Moormends Luggage Store, the Green Tree Deli and the Gerald Bland Gallery. Kooby said the co-op he’s rented from for the past 50 years offered him a lease at double the $35,000-a-month he’s currently paying. Gerald Bland – who rents space for his antiques gallery from a co-op – said he’ll be moving at the end of March after his lease expires. He was offered a new lease with increased rent, which he declined. It’s unclear whether Jackson Hole, Moormends and the Green Tree Deli were forced to close or move as a result of the change to the 80-20 rule; Jackson Hole closed last spring for repairs and a rental sign only recently appeared it its former space. An employee at another Jackson Hole location said the Madison Avenue restaurant would be moving, but she didn’t know where or when the move would take place. But whatever the reason, it’s clear there is a small-business exodus from Carnegie Hill. Kooby said his store was the last holdout on a block that once had many staples of life in New York – a butcher, a hardware store, an art gallery and a cobblers, in addition to the recent businesses that have left. One of his employees, who gave his name as Khem, is originally from Guyana and has worked at Blacker and Kooby for 30 years. Like his boss, he’s stoic in the face of the store closing. Kooby’s daughter, Vanessa, has taken over the printing side of the business at 1390 Lexington Avenue. Blacker and Kooby will still offer custom invitations and stationery, as well as engraving, letterpress printing and calligraphy, at that location. Still, she said, it’s the end of an era. Businesses being priced out of the neighborhood is not a condition unique to Carnegie Hill, and not every co-op in the city will be able to increase their retail space rents. Under the new law, a building must pass one of three criteria in order to keep their federal tax benefits, which include valuable tax deductions; a co-op must either meet the original 80-20 requirement, spend at least 90 percent of their revenue toward things that will benefit tenant-shareholders, or commit at least 80 percent of its total square-footage for residential use. Nevertheless, real estate experts and brokers have hailed the regulation change as a tremendous benefit to co-op buildings, which can now entice buyers with low-maintenance apartments and, in some cases, actually offer a dividend to property owners drawn from the rent they charge ground-floor retailers. But federal tax regulations and real estate boons aren’t important to Carrie Doyle, who grew up in Carnegie Hill and now lives nearby with her family. For her, the physical change in the neighborhood is as heart-breaking as it is striking. Do you have thoughts about the changing face of the Upper East Side? Email editor.ot@strausnews.com and your comment could be printed in Our Town next week. This entry was posted in News and tagged Carnegie Hill, rent increases, small businesses, Upper East Side. Bookmark the permalink.